What other game out there boasts of three different ways to win: the good way, the bad way and the ugly way? With three different winning possibilities there is no doubt this is a game that will keep you on your toes. Outlaws Last Man Standing is a game where you'll go head to head with your opponent in a western style draw. 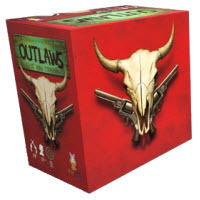 Outlaws is a card game that uses some unique accessories that truly complete the western theme. Fun for players ages 12 and up, two people will quickly draw until there is a winner. Be sure to check out the game rules and instructions for all the specifics on how to play. This game is a sure bet if you want something different, clever and suspenseful. There are three ways to win the game: The Good Way, the Bad Way and the Ugly Way. Please see the game rules for specifics. Inside the box you'll see 20 character cards with stand, 17 item tokens, 6 headline markers, 2 gaming aides, 20 character mini-tokens and the official Outlaws game rules and instructions. Please keep in mind that the official Outlaws board game rules and instructions could be different depending on the game version you have. The rules below are some of the exact directions on how to play Outlaws. Share with us your comments, funny stories, tips, advice, strategies, creative ways to play, questions about how to play, problems with the rules or anything you want about Outlaws. All submissions will be reviewed within 24 hours. Click here to add your Outlaws comments.